Coming soon, pictures of the finished grilled shrimp, camera battery died…Straying a bit and making considerably less sauce from the Madhur Jeffrey’s prawn recipe, I decided to grill the prawns and brush them with the original sauce rather than cook the prawns stove top in the sauce. The sauce has a pleasant sweet tart taste and while I couldn’t add hot peppers i tossed in a little diced peppadew and a little bit of diced hatch green chile, I reserved some of the sauce seasoned it with a little Sriracha sauce for a little more heat for myself. I made the sauce a day ahead of time and I do believe that it benefitted from the overnight rest. I did added a bit of lime and lemon zest and fresh cilantro to freshen it up a bit. Delicious and I will make the whole recipe one night for a company dinner keeping in mind the little changes that I made. Served with quinoa couscous salad with almonds, raisins, saffron and onions. 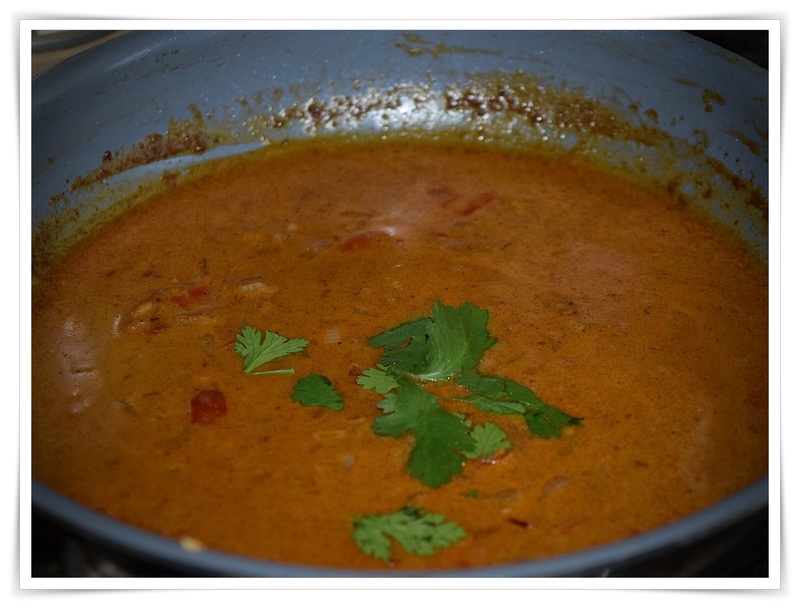 Below is the original prawn recipe which I adapted for a smaller amount and I made 1/2 half of the recipe. Heat a grill or grill pan on high (I used the grill/griddle pan to sear the shrimp brushing a little sauce over and served the rest of the sauce on the side. Pour the oil into a non-stick karhai, wok or large pan, about 25 cm in diameter, and set it over a medium heat. Put in the onion and brown for about 5 minutes. Add the garlic and fry for a further 3 minutes, then tip in the cumin, chilli powder, coriander and salt. Reduce the heat and mix well for 1 minute. Pour in the coconut milk and spoon in the tamarind concentrate, then crumble in the stock cubes and add the sugar. Bring to a boil, then reduce the heat to a simmer. Reduce the sauce until it is thick. Mix in the prawns and chillies and cook for 2-3 minutes until the prawns are just opaque and cooked through, then serve.